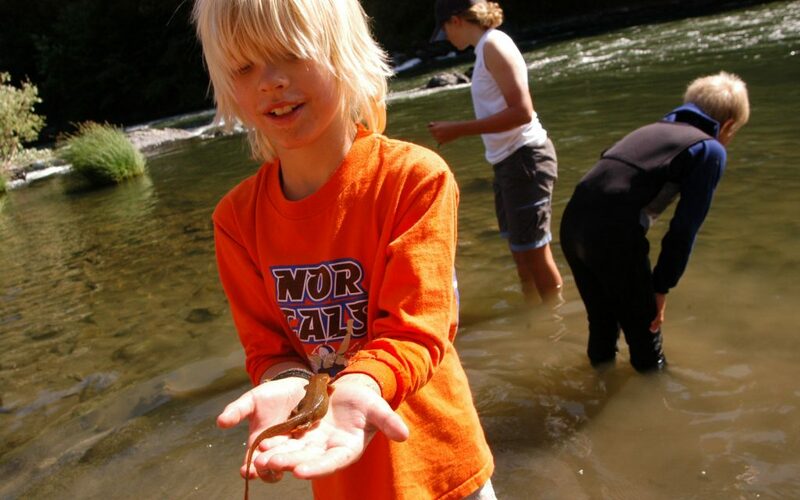 At one point during our 5-day rafting trip down Oregon’s wild and impossibly scenic Rogue River, my 10-year-old daughter, Markie, became obsessed with the notion of catching a rough-skinned newt. This was after a day during which we had leapt from 15-foot-tall cliffs, swam through trains of standing waves, and negotiated scream-inducing rapids mined with boulders, huge suckholes, and raft-swamping ledge drops. The sun had just slipped behind the rim of the gorge and our party of 11 had emptied a gigantic Dutch oven of its chicken-chili-cornbread contents. We’d drawn our camp chairs close as the conversation turned to old college stories and river stories and assorted misadventures endured in the pursuit of adventure. But Markie wanted to catch a newt. She’d plucked a reed from the riverbank, bored a hole in a hunk of jicama left over from dinner, and strung the two together in the form of a primordial fishing implement from “Survivor.” Could I help? I could not have been more comfortably slumped in a camp chair, or more engaged in the rounds of tall tales. In fact, I could not have been less interested in the remote possibilities afforded of South American legumes, a piece of tall grass, and aquatic vertebrates. So, of course, I got up from the chair and dangled jicama for newts with my daughter. Within minutes, one of the bug-eyed creatures sidled up to the sodden bait and started nibbling. Markie slowly pulled in the reed, and I scooped the salamander up in my hands. We have talked about that moment for months. We will talk about it for years. It taught me a lesson in how to turn a guided wilderness trip into one of the greatest gifts you could give your kid. And yourself. Wilderness trips impose on a relationship a commonality of purpose and direction and even velocity of experience. You slow down to the pace of the paddle, of the trail rising ahead, of the dry fly drifting through the riffle. There is no electronic hypnosis through a flat-panel screen. There are constellations, not pixels. This, in turn, provides fertile ground for the sort of life-lasting connections that become increasingly difficult to foster as a son or daughter soars through the teenaged years. Our trip to the Rogue had its genesis in Rob Kesselring’s self-published memoir Daughter Father Canoe: Coming of Age in the Sub-arctic, the story of Kesselring’s and daughter Lara’s 27-day canoe trip through the Northwest Territories in the summer of Lara’s 14th birthday. I shared the book with Markie, and she immediately insisted on a pact: Let’s do something like that some day. 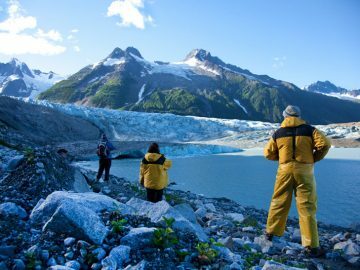 I’ve paddled remote rivers across Alaska and Canada, but to work up to a multi-week father-daughter trip, I told her, we’d need a guided, multi-day trip as a shake-down cruise, of sorts. 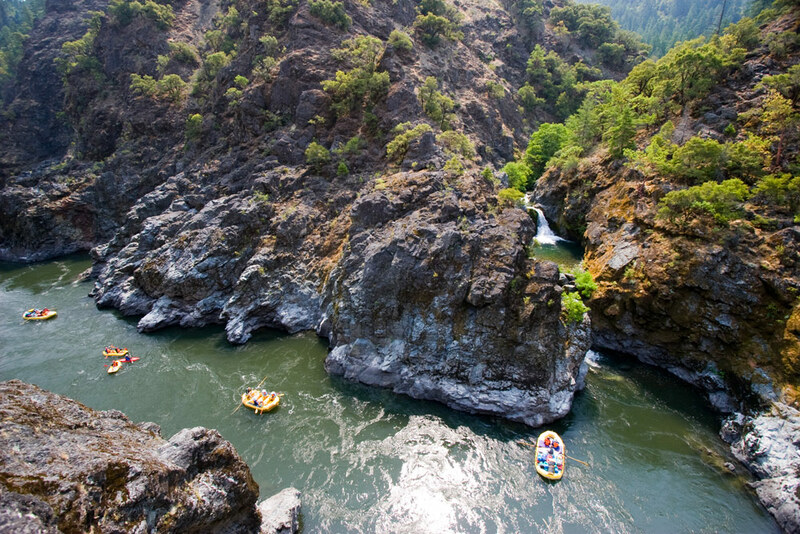 Oregon’s Rogue River was a perfect fit. 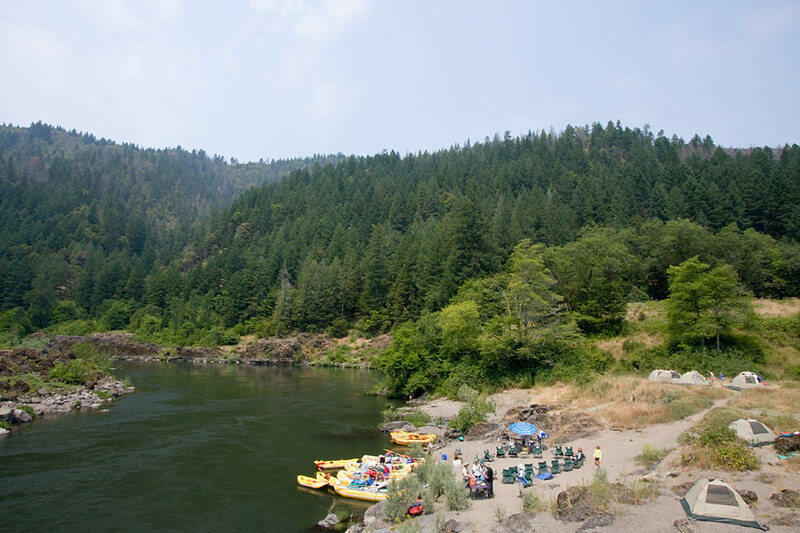 We put in at Oregon’s Galice Resort — 3 oared rafts piled high with tents, personal gear, food, inflatable kayaks, and a group of wide-eyed rafters ranging in age from 10 to nearly 70. For 5 glorious, blue-sky days we floated and swam and paddled our “duckies” through roaring boulder fields and narrow canyons. We caught snakes and day-hiked to ghost ranches and picked blackberries by the bucketful. We watched river otters and launched water fights and lay in our tent with the doors zipped open, wishing for one more falling star. Before the trip, I could not have imagined the endless and vast and varying types of pure hoot-and-holler fun we packed into 5 too-short days. But there was more. Over the previous year, Markie had grown up — up and a little bit away — at an astonishing rate. There were fewer requests for bedtime stories. Her door sprouted a sign requesting potential trespassers to please “knock first.” She and I have always been connected at the soul — the wildlife lovers, the contrary spirits, the gregarious loners. It has been said that parenting is largely a process of learning to let go, and letting go was something I’d been doing a lot of where Markie was concerned. 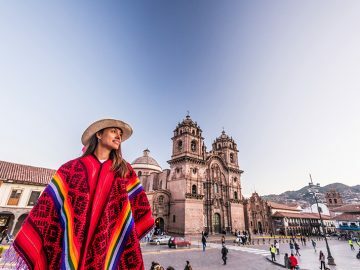 I yearned for a new way to connect, a means to propel us into a new kind of relationship rooted in her emerging self-awareness of who she was apart from mother and father, and where her spirit seemed to be taking her on the untested spectrums of self-reliance, comfort with adventure, and new experience. When we leapt together off a high cliff and plunged into a bathtub-sized swimming hole of 63-degree water, she emerged from the river with her arms around my neck, screaming her desire to jump again and again and again and again. I knew then that answers to certain questions of the future were coming to her and I together. And I knew that I would return to that exact spot in exactly 3 years with my 7-year-old son, Jack. Are family-oriented departures available? Some outfitters offer itineraries—and hand-pick guides—specifically for trips where there will be kids or youth along. This way you won’t be paired with a honeymooning couple or stuck with a guide who will make that second PBJ only begrudgingly. What is the client-to-guide ratio? 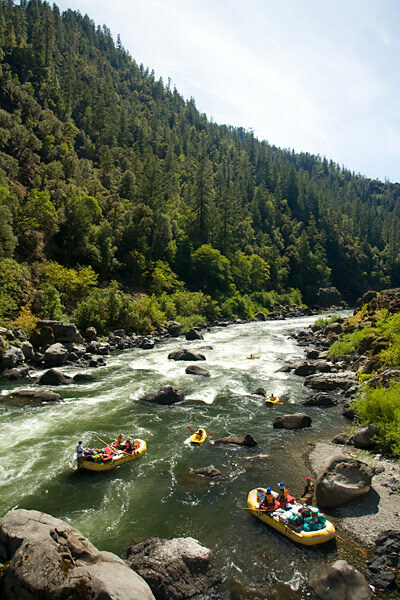 The number (and character) of the guides on our Rogue River trip was perfect: 3 guides to 11 clients. There are no hard-and-fast rules about this, for different trips require a varying set of helping hands. If the client-to-guide ratio creeps above 6-to-1, however, have a serious conversation with the outfitter about your expectations. What is the daily pace of the trip? When I first read that we’d be on the water an average of 6 hours a day, I was a bit concerned. What in the world would we do the rest of the time? The answer: Climb trees, jump off cliffs, skip rocks, explore hidden side canyons. Take a hard look at the itinerary to make sure you’re not being pushed. Let your child help choose the trip. Maybe you think it would be grand to horsepack for 5 days with your kid. Maybe your kid doesn’t. Maybe you should listen. My friend Tim Lassiter recently proposed to Austin, his 14-year-old son, a serious backcountry mule deer hunt. “But I could see it in his eyes,” Lassiter reported later. “He didn’t want to disappoint me, but he wasn’t jumping up and down about the idea, either.” Lassiter asked his son for his idea of a dream trip with dad, and then they booked a Costa Rican multisport venture that involved fishing for sailfish, ATVing through the jungle, touring local villages, and hiking through national parks. Personalize the trip. Commercial wilderness trips have to rely on a certain degree of cookie-cutter logistics. The group sleeps in similar tents, eats the same food, wears the same color life jackets. Do what you can to individualize the experience. Early on, Markie asked if we could take our beloved yellow and purple Marmot tent; she loves waking up to the ethereal yellow glow that suffuses the tent interior when the sun rises. 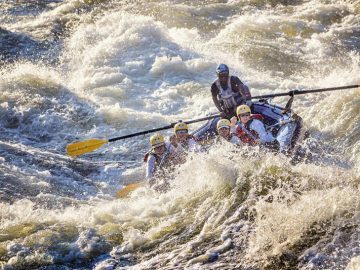 It seemed ridiculous given that OARS provided fine tents that didn’t need to be packed, checked on an airline, and fussed over. But we took it. And I’ll baby that yellow tent for as long as I can, knowing that each time we pitch it in the future, we’ll remember our clifftop campsite at Mule Creek Canyon, or the sandy beach along some unnamed riffle where we caught the newts. Consider taking a friend. I anguished over this. My sole purpose for putting this adventure together was to spend sustained one-on-one time with Markie and allow for serendipitous, meaningful moments of connection to happen of their own accord. I didn’t want to be a chaperone. But I also was aware that the welcome mat between father and child might wear thin during 5 days of togetherness. In the end, Markie and I had a good chat about what this trip was all about — and we invited George and Katie, another father and daughter, to join us. I knew George would share my desire to center the trip on the bond between father and child, and their presence added immeasurably to our experience. But I still worked hard to maximize face-time with my daughter. When she wandered off to pick blackberries, I wandered with her. When she turned in at night, I turned in, and our time together in the tent, reading and writing in our journals, led to moments of connection that we’ll talk about for the rest of our lives. It was no easy feat to leave the riverside gathering spot when the story-swapping grew to a fevered pitch. But I’m glad I did. “How about this!” Markie grinned one morning, as she scooped up hunks of cantaloupe from the riverside buffet. “Appetizers for breakfast!” For 5 days, our girls never complained, never groused, never pouted. 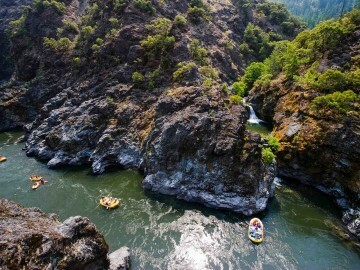 They played cards in the tent, scooped up minnows with the camp colander, scrambled barefoot across miles of lichen-covered boulders, and dutifully marched off to “the Groover” — the designated camp latrine — with a raft paddle in hand with which to mark its occupancy. They washed their own dishes. They said “yes, ma’am” and “no, sir” and “please” and “thank you” with no prodding. They learned the lesson of getting along with others even when those others were teenaged boys for which (at least for the time being) they can ascribe neither purpose nor function in their universe. Dealing with, and being happy with, the circumstances immediately at hand is an enduring lesson of wilderness travel. It was as if the woods and the water and the lack of civilization had somehow civilized them — the cotillion of the Rogue. And I thought: We will, sweetheart. A week or two at a time. This essay was originally created for the OARS Adventures catalog. For more compelling stories from other renowned writers, request our latest catalog today!